Cable turning the wrong way. I took a look at my work and realized that one of the cables was not crossing the way it was supposed to. ARGH!! I tried to convince myself that it would be “OK” and no one would notice, but I couldn’t do it. The sweater marked where I had to pull out. I put a double pointed needle in the place where I had to rip down to. 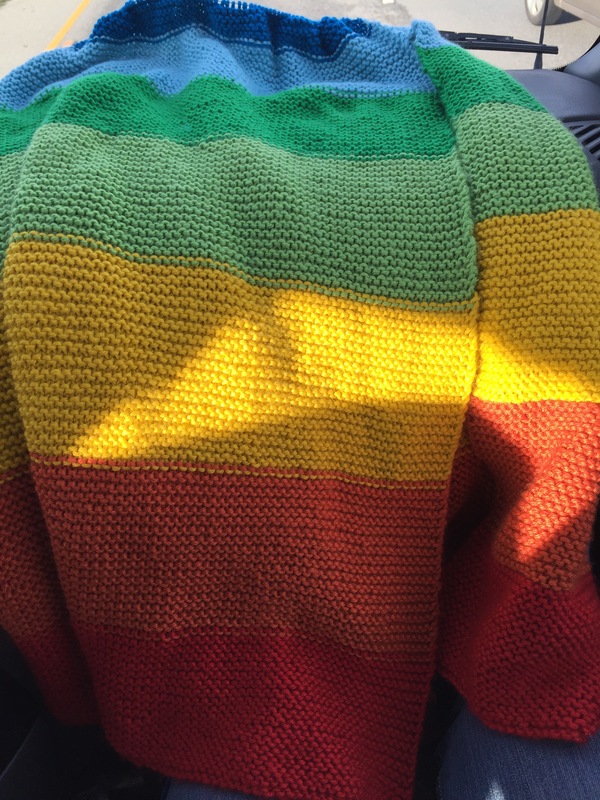 Just FYI…it was 11 rows down and encompassed 20 stitches. EEEEK!! Did I mention I had never done this before?! The “live” stitches before I began ripping. I made sure that I knew exactly where I was on the cable chart before I began ripping these stitches out. All 11 rows ripped back. This was really the scariest part. All that yarn, all those stitches!! I had very diligently erased my marks on the chart as I ripped each row out. 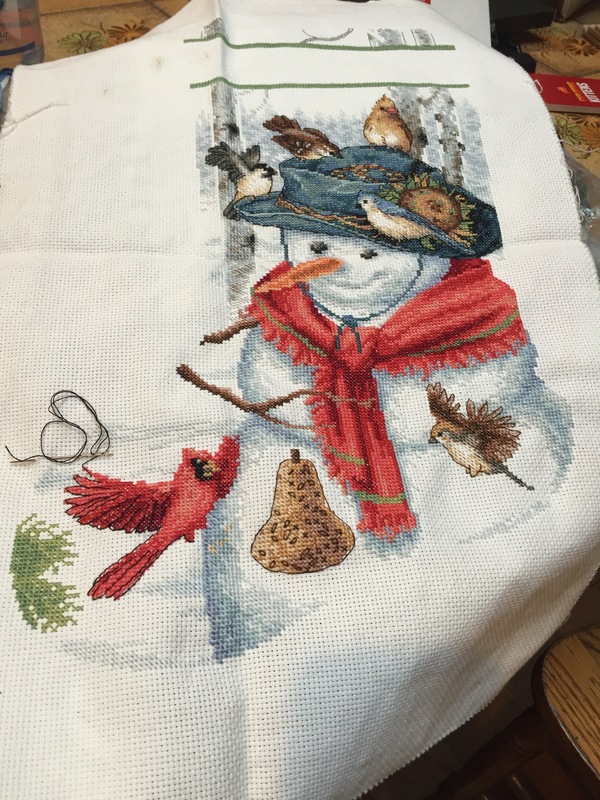 I also counted the live stitches each row to make sure I still had 20. The “live” stitches picked back up onto a double pointed needle. I managed to get all the stitches on a needle without twisting them or letting them drop down any farther. I am using a dpn in the same size as the rest of the knitting. The mess of pulled out yarn. 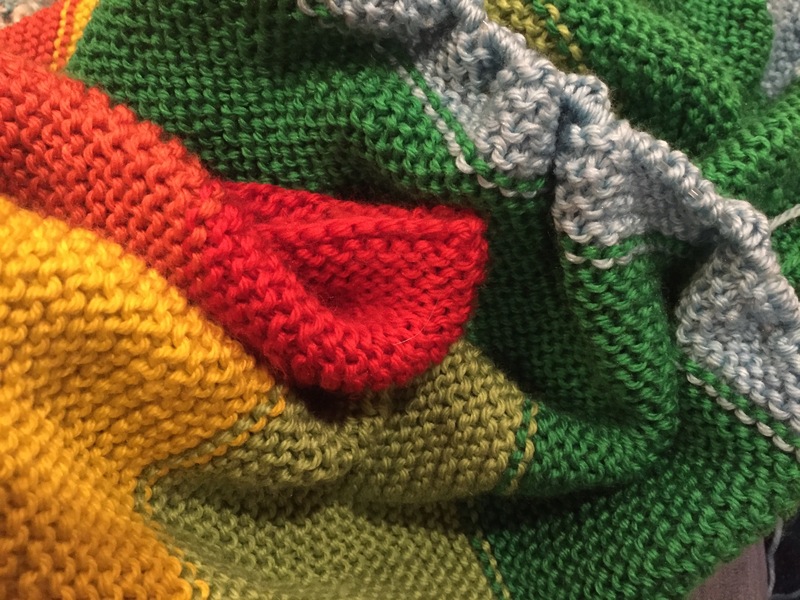 At first it was difficult to determine which piece of yarn to use for which row, but I soon recognized how to figure that out. Not too hard – just don’t think about it too much! The cable is fixed and I am at the half way mark (5 1/2 rows) to getting back to where I was before all the ripping started. Cables back where they should be! WHEW!! It is done – it only took 2 hours of intense concentration and everything is as it should be. I learned so much from this – I always learn more from my mistakes than from anything else. Hopefully, I won’t have to repeat this again!! Moved onto the next blue color. Working on this during a long car ride home from Thanksgiving vacation. As usual, I am starting this weave-a-long after everyone else has already finished. BUT…at least I’m getting there! 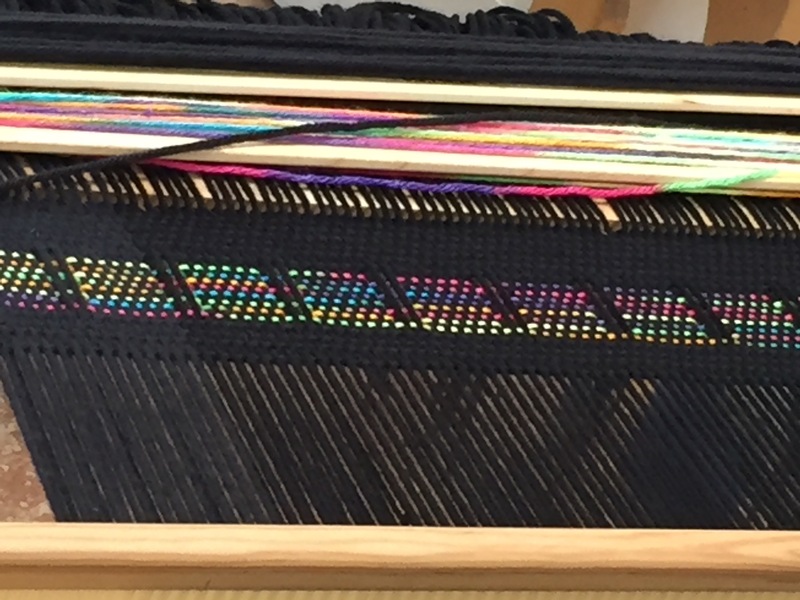 I got the loom warped and for the first time, I used sticks to pill all the threads together at the beginning instead of waste yarn. I have been reading that some weavers prefer this method. I will share my thoughts after I have finished this project. 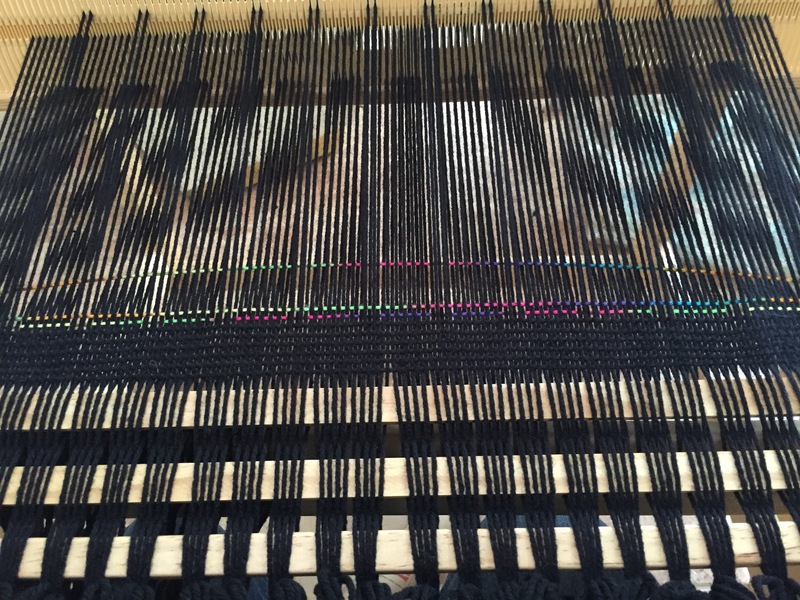 This is the first section woven. I am using random acrylic yarn for the warp and some simply soft I had in the cabinet for the weft. 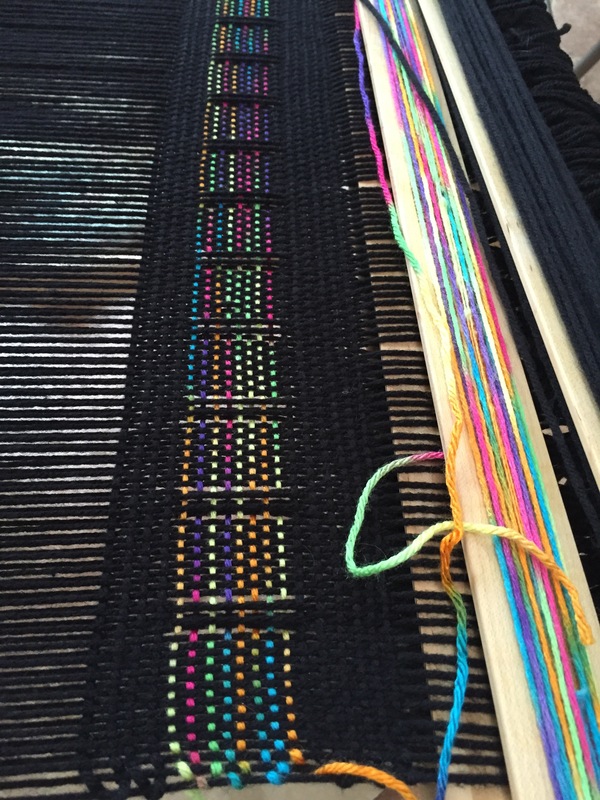 The weave-a-long instructions are on Kelly Casanova’s you tube channel and can be found here. Some of her instructional videos are free and some of them are paid. This one is paid. Her videos are extremely well made and easy to follow. I used one of them for the woven tote bag with great success. The instructions tell us to use a solid yarn for the honeycomb part and I chose the variegated because I have a lot of it. I think, for the next section, I will try a solid color and see what the difference is. I made it to the first of the blue shades – “sky”. 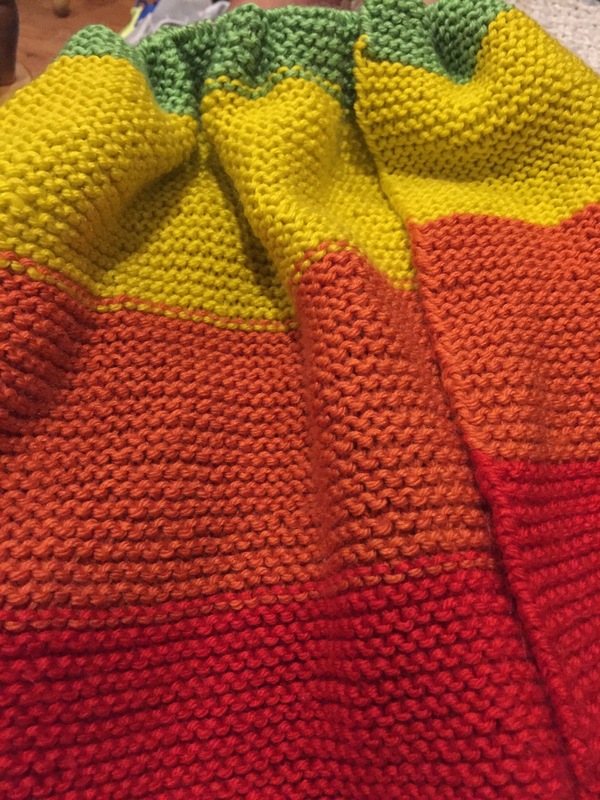 I’ve moved onto the next color on the Mighty Rainbow Blanket! 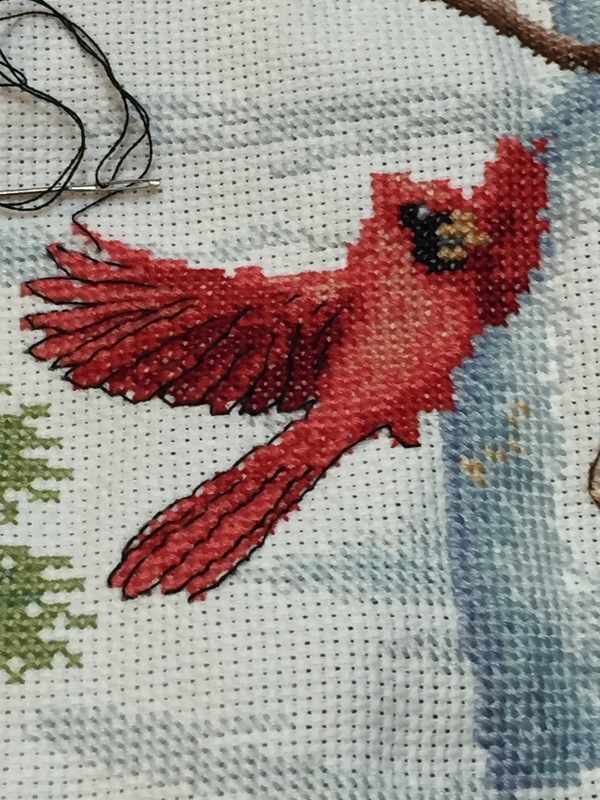 All the cross stitching is done! Now working on the back stitching. Then on to adding the name. The finish is close at hand!! I have reached the green on this blanket!! 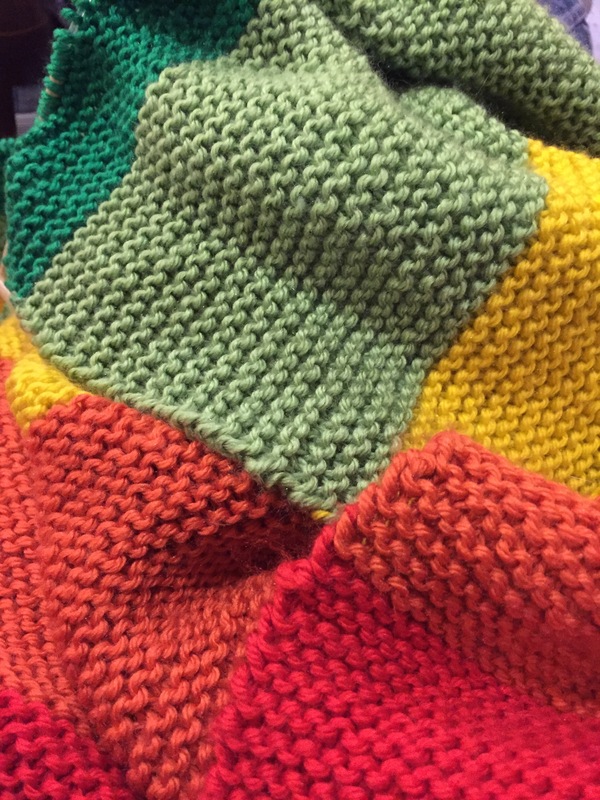 Each time I start anew color on this blanket, I am sooo excited. But half way through I can’t wait to start the next one. I am loving this green but now can’t wait for the next color.